I have finally lined my peacock tail bag! Hurray! I put it off for several weeks after the CAL ended making up ridiculous excuses because I'm not as passionate about sewing as I am about crocheting. 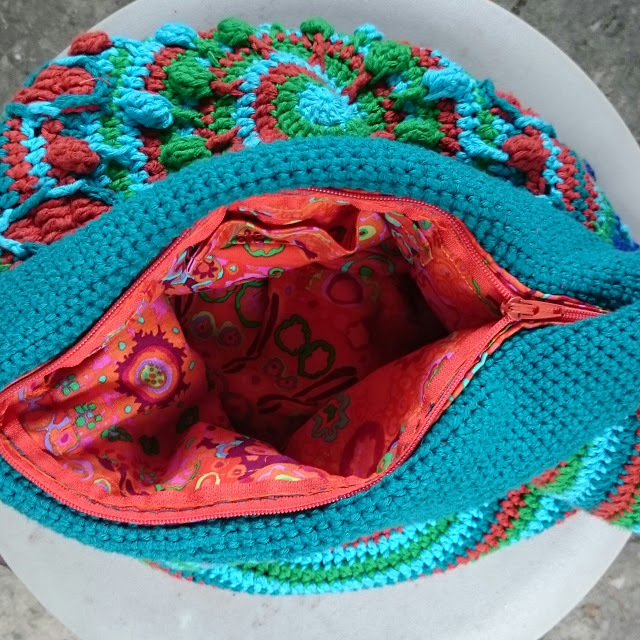 I have made so many crochet and knitted bags over the years and I just don't use them as much as I should because they are not fully functioning bags without a lining. It wasn't going to happen this time. Of course, I ambitiously decided to insert a zipper making the exercise even more daunting and leading to further delay. The lining is leftover Kaffe Fasset material purchased five years ago from quilting shop Poppy Patchwork in my old neighborhood of Westbury on Trym in Bristol. I bought this glorious fabric to line a knitted Debbie Bliss cable bag that I made in 2011 Fiddly Fushia Bag. This was the last and only other time I have lined a bag! I told my Friday workshop students that I was going to line the bag making up a whole host of excuses for the delay and they teasingly told me "challenge yourself" - a phrase that I am very fond of saying to them! My sweet crochet friend Jodie who writes the wonderful Lupey Loops blog also encouraged me. I do find telling fellow crafters about my plans stops me from procrastinating quite as much! I started with the peacock tail bag cal lining tutorial from Lilla Bjorn Crochet for a general idea and then visited my local sewing studio Thimblefingers to buy my interface and zipper so that I could get a few more tips on how exactly I was going to go about making the liner with the zipper. The best tip from the extremely helpful owner was where exactly I should attach my liner. I had envisaged sewing it an inch or so below the opening but I was told that the seam would be more robust if I chose the existing natural seam between the colorful rounds and the band around the top. My lining isn't perfect but I am very pleased. I know that I will take my bag out far more now that it has a zippered lining. I even added a cellphone-sized inside pocket. Go me! I found two helpful online tutorials for adding zippered linings to crochet bags if you're feeling inspired to have a go. Fab crochet designer and blogger Stephanie of All About Ami has a tutorial for a lining with a zipper and a circular base: Crochet Zipper Pouch. Stephanie gave a link to a second helpful photo tutorial from super crochet designer Jesseyz of Chocolate Mints in a Jar Zippered Lining Tutorial. Well now that I've achieved this I'm feeling confident enough to make a project bag or two. I'm going to use this super cute project bag tutorial from the talented Sam, crochet designer, blogger and podcaster from Betsy Makes. If you'd like to tell me about your experiences with lining a bag, please do let me know in the comments below. Anyway, do have a wonderful week y'all. Lovely bag Tamara! I was trying to read and understand the pattern. I would love to make one. I may need some help though. Thank you Anjali! 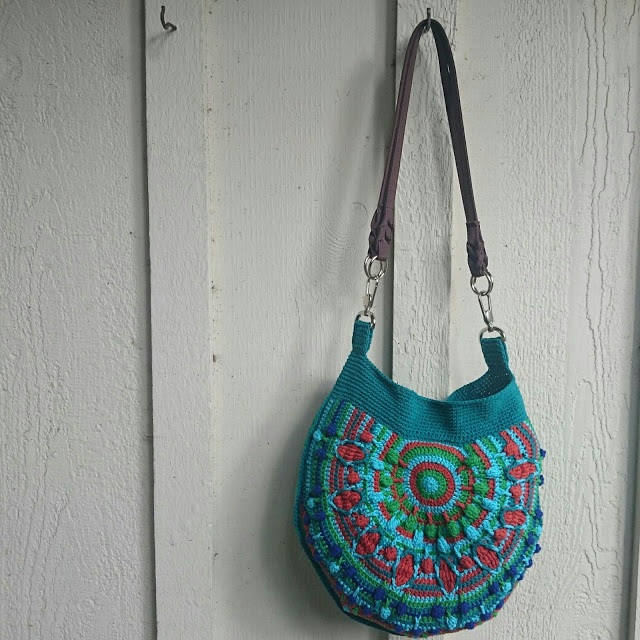 I would love to help you make your own peacock tail bag. Just let me know a good time for you and we'll go through the pattern together. See you soon! It takes guys to voice your grand plans for ambitious projects but you are right in that the necessary accountability for one's statements is a great motivator! Well done for persevering with the sewing even though it's not your favourite thing. It gets easier the more you do it. Beautiful work of which you can be pleased. I am sure you are right Jodie about it getting easier the more you do it! I quite enjoyed the sewing. I might make that project bag one of these days!